Grasshopper Pie has a minty green base with a faint shimmer and shredded black glitters. All nails are 2 coats with top coat. I will admit I've never heard of a grasshopper pie before, but it sounds and looks delicious! Just as yummy as this polish looks! :) Formula was perfect and all the shredded glitter sat flat on my nails. Bayou Baby Cakes has a clear base loaded with gold shimmer and green, gold and purple glitters. Each bottle comes with one pink "baby" glitter (it's really a skull glitter, but I always believe the mind sees what it wants because I still see them as 4-legged octopi :P ) All nails are 1 coat over a "needle drag" mani with Crema and Velvet Violet. Another mani showing off Bayou Baby. :) Here it is used as a gradient over 2 coats of Violet Velvet. 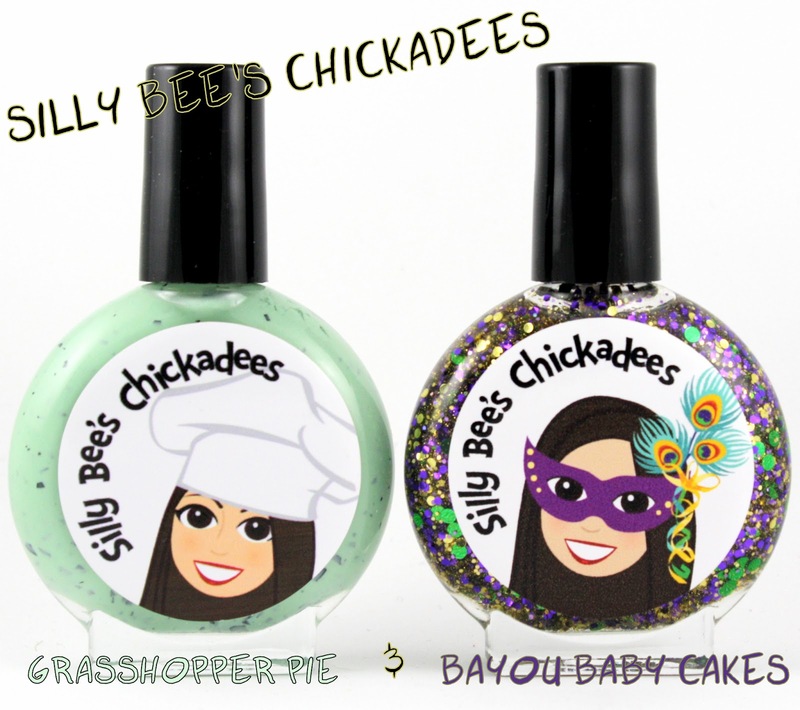 Both of these polishes are available now through Silly Bee's Chickadees Etsy store. Make sure to follow Silly Bee's Chickadees on Facebook, Pinterest and Instagram and follow her blog!